Thanks to: Jean-Pierre Berthet, Michael Cuscuna, Yvan Fournier, Dieter Hartmann, Hubi Horst, Jørgen Jepsen, Jörg Koran, Georges Mathys, Kurt Mohr, Dan Morgenstern, John Norris, Ted O'Reilly, Michel Ruppli, Mario Schneeberger. 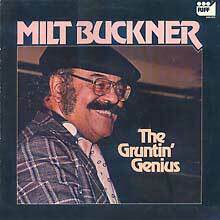 Revision note: The caption under a photo of Milt Buckner relaxing has become more detailed. lllinois Jacquet (ts, bassoon-1), Milt Buckner (p, org), Roland Lobligeois (b), Jo Jones (dr). 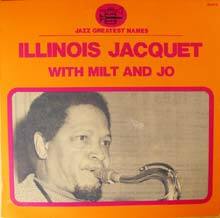 On -1: The Illinois Jacquet Trio: Illinois Jacquet (ts), Milt Buckner (org), Jo Jones (dr). On -2: probably Illinois Jacquet (bassoon) and the Claude Bolling Orchestra (unidentified musicians). On -3: Illinois Jacquet (ts), Milt Buckner (org), probably Jo Jones (dr) , the Claude Bolling Orchestra (unidentified musicians). On-4: Illinois Jacquet (ts), probably Claude Bolling (p), Milt Buckner (org), unidentified (b, possibly Roland Lobligeois or the bassist from Claude Bolling's Orchestra), probably Jo Jones (dr). This broadcast (except The Man I Love) can be downloaded for a fee from the website of the Institut national de l'audiovisuel de France (www.ina.fr). The drummer on Flying Home and Robbin's Nest probably is Jo Jones, but there is a possibility that it is Claude Bolling's (unidentified) drummer. The complete broadcast starts with eleven tracks by the Claude Bolling Orchestra featuring neither Buckner nor Jacquet or Jones (and thusly not mentioned here). The above tracks were next, then the broadcast ended with Bolling's Orchestra playing Happy Congegration. 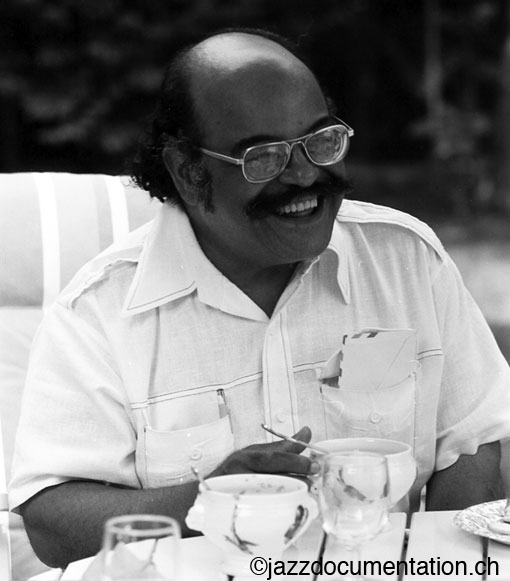 Caravan features a long drum solo and was issued on Black and Blue under Jo Jones' name. Buddy Tate (cl-1, ts), Milt Buckner (org), Jo Jones (dr). Note: Black & Blue 333068 is titled "Midnight Slows Vol. 4", Black & Blue 333075 is titled "Midnight Slows Vol. 5". Milt Buckner (p), Major Holley (b), Michael Silva (dr), Jimmy Slyde (tap dance). Barclay Studio, Paris, February 25, 1974. Milt Buckner (p), Major Holley (b), Jo Jones (dr). Note: Black & Blue 333063 is a sampler called "Boogie Woogie Masters". Further titles on this LP were recorded February 28. For one further track on Jazz Odyssey (F) 011 look at february 16, 1973. Further titles on this LP were recorded February 26. 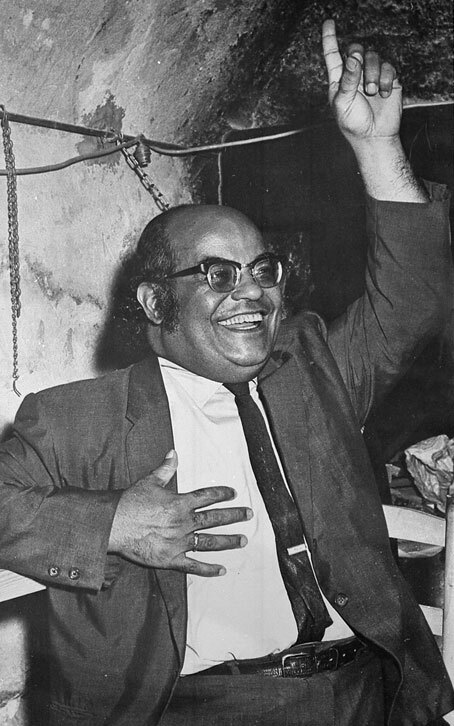 Milt Buckner in an unidentified jazzclub, mid-seventies. Eddie "Lockjaw" Davis (ts), Milt Buckner (p), Jimmy Leary (b), Gus Johnson (dr). 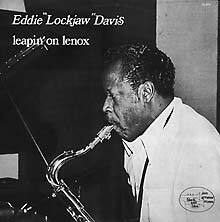 Note: Delta 17130 is a CD called "Eddie 'Lockjaw' Davis: Body And Soul". It doesn't rerelease "The Shadow Of Your Smile". Jodie Drake (voc-1), Illinois Jacquet (ts), Milt Buckner (org), Jo Jones (dr). 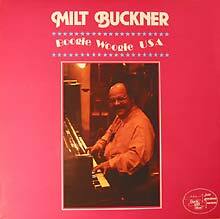 Thanks to Arild Wideroe for information about this rare LP. November 10 1974. Photographer unknown, from the Otto Flückiger collection. 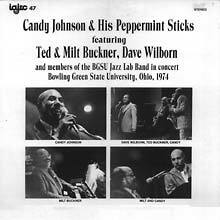 Ted Buckner (as-1), Candy Johnson (ts-2), Milt Buckner (org-3, p-4), Karen Wilcox (org-5), Leonard White (b), Al Johnson (dr), Dave Wilborn (voc-6), Members of BGSU Jazz Lab Band (16 pieces including four tp, four tb and five saxes)-7. Note: International Association Of Jazz Record Collectors IAJRC 47 is an LP released 1986. Bowling Green State University, Ohio, November 10 1974. Photographer unknown, from the Otto Flückiger collection. Big Nick Nicholas (ts, prob. voc-1), Milt Buckner (org-2, p-3), Roy Gaines (g, voc-4), Roland Lobligeois (b), Panama Francis (dr), unidentified (voc-5). This nearly two hour broadcast can be downloaded for a fee from the website of the Institut national de l'audiovisuel de France (www.ina.fr). It is possible that the titles of Riff in Riffin' and Fancy in Blue were applied by the radio staff or the INA staff. There are two people singing on Deedle Dee Deedle Dum, Gaines has the lead, while the answering person is not Milt Buckner. Big Nick Nicholas seems to be most like the person in question. It is not clear who does the Louis Armstrong impersonation on What a Wonderful World. Big Nick Nicholas (ts), Milt Buckner (org), Roy Gaines (g), Panama Francis (dr). Roy Gaines (g, voc), Gene "Mighty Flea" Connors (tb), Milt Buckner (org), Panama Francis (dr). Note: Black & Blue 59552-2 is the CD issue of this material. Milt Buckner org, p, vib, voc), André Persiany (p), Roy Gaines (g), Roland Lobligeois (b), Panama Francis (dr). Note: Black & Blue 33087 was also released as Inner City CJ 141. Black & Blue 929.2 is the CD issue of this material. It also contains "Talk Of The Town" from the session of July 4, 1977. Black & Blue 333095 is a sampler titled "Dansez Vous Le Bop?" Milt Buckner (org), Henri Chaix (p-1), Dave "Panama" Francis (dr). 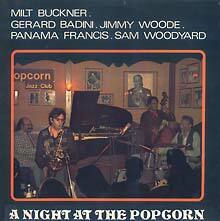 Gérard Badini (cl), Milt Buckner (p), Jimmy Woode (b), Sam Woodyard (dr). Note: Riverboat 900280/81 is a 2LP set. The Recording was produced by Black & Blue. 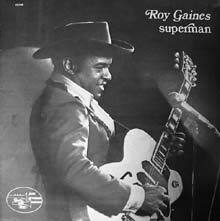 In 2003 a part of this material including previously unissued tracks was released on a CD in the "Definitive Black & Blue Sessions" series. 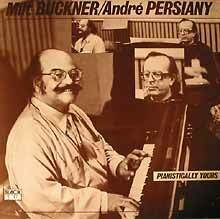 According to Arild Wiederoe, Buckner only played piano on march 1 because the organ was broken. 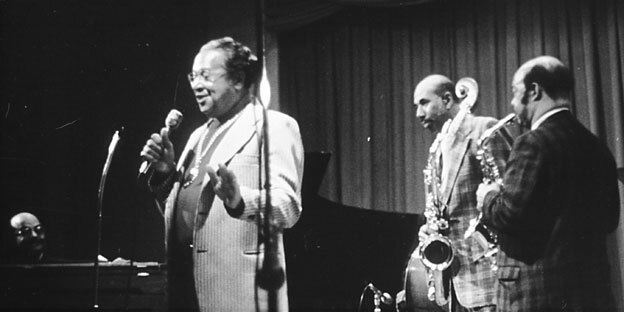 Milt Buckner (org), Jo Jones (dr), Illinois Jacquet (mc). Note: From the soundtrack to the film "Jazz En Provence", distributed by Fil-à-Film. Black & Blue 333080 is titled "Jo Jones, Cozy Cole, Panama Francis: Explosive Drums". Illinois Jacquet (ts-1), Milt Buckner (org), Jo Jones (dr-1). Note: From the soundtrack to the film "Jazz En Provence", distributed by Fil-à-Film. Unidentified (tp), Wani Hinder (ts), Dany Doriz (vib), Milt Buckner (org, voc), unidentified (g), Michel Denis (dr). Note: This Black & Blue LP (33.151) remains unreleased. Information from a white label testpressing from the collection of Otto Flückiger. Laserlight CD 17 154 (and possibly Jazztime (F) CD 45 is called "Jazz Live from the Caveau de la Huchette - 45th Anniversary" other tracks on this CD are by Maxim Saury, The Stephane Guerault - Benny Vasseur Quintet, The Marc Laferrière Dixieland Jazz Band, Memphis Slim - Michel Denis, The Francois Guin Swing Quintet, Raymond Fonseque and his Original Band and the Lionel Hampton Big Band. Milt Buckner (p, voc, org), André Persiany (p), Roland Lobligeois (b), Roger Paraboschi (dr). Black & Blue 917 is a CD. It also has a trcak called "Pour Toutes Mes Soeurs Take 2" It is not clear wheather it is from this session. Wallace Davenport (tp), Buster Cooper (tb), Earl Warren (as), Eddie Chamblee, Arnett Cobb (ts), Milt Buckner (org, vib, voc), André Persiany (p), Roland Lobligeois (b), Panama Francis (dr). 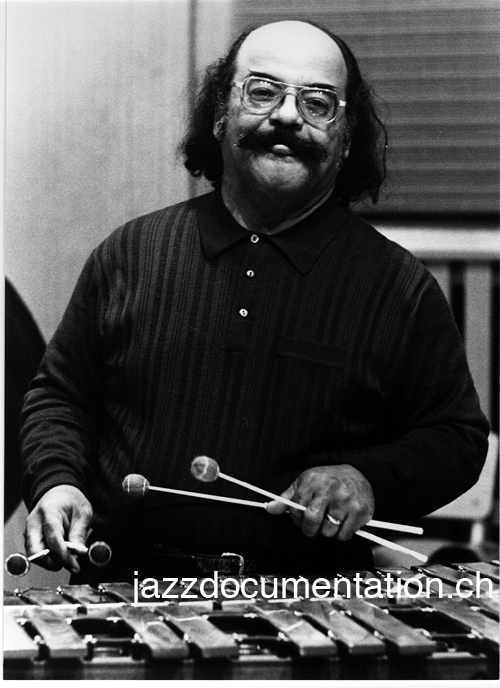 Note: The CD Black & Blue 909.2, Milt Buckner & His Alumni: The Definitive Black & Blue Sessions, is a collection of 13 previously unissued tracks by Milt Buckner and his (Lionel Hampton) Alumni , released 1998. Wallace Davenport (tp), Buster Cooper (tb), Earl Warren (as), Eddie Chamblee-1, Arnett Cobb (ts), Milt Buckner (org, vib-2,), André Persiany (p, arr-3), Roland Lobligeois (b), Panama Francis (dr). Note: Black & Blue 59099-2 and 892 are CD issues of this material. Wallace Davenport (tp), Buster Cooper (tb), Earl Warren (as), Eddie Chamblee-1, Arnett Cobb (ts), Milt Buckner (org, vib-2,), André Persiany (p), Roland Lobligeois (b), Panama Francis (dr). 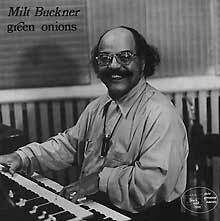 The CD Black & Blue 909.2, Milt Buckner & His Alumni: The Definitive Black & Blue Sessions, is a collection of 13 previously unissued tracks by Milt Buckner and his (Lionel Hampton) Alumni , released 1998. It has to be checked, if the versions on this CD are different from the other(s). It is not clear which of the two takes of King Porter Stomp is on CD 909.2. Wallace Davenport (tp), Buster Cooper (tb), Earl Warren (as), Eddie Chamblee (ts, except-2), Arnett Cobb (ts), Milt Buckner (org, vib), André Persiany (p, arr-1), Roland Lobligeois (b), Panama Francis (dr). Note: -1 was issued as by Arnett Cobb, -2 as by Earl Warren. 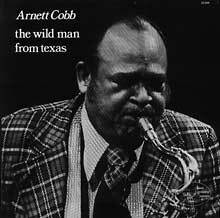 Black & Blue 33099 is titled "Arnett Cobb: The Wild Man From Texas". The CD Black & Blue 909.2, Milt Buckner & His Alumni: The Definitive Black & Blue Sessions, is a collection of 13 previously unissued tracks by Milt Buckner and his (Lionel Hampton) Alumni , released 1998. Wallace Davenport (tp), Buster Cooper (tb), Earl Warren (as), Eddie Chamblee (ts, except-2), Arnett Cobb (ts), Milt Buckner (p, org, vib, voc), André Persiany (p), Roland Lobligeois (b), Panama Francis (dr). date, place and photographer unidentified. A copy of the second part of a radio broadcast from this concert resides in the collection of Arild Widerøe. This concert was organised by Ernst Bührer for the Konzertgemeinschaft Schaffhauser Jazzfreunde. It was recorded by Heinz Wehrle of Radio Studio Zürich (DRS). The tunes played on the first part of the broadcast are not known. After "Pour Cooper" the audience want to hear some more of Buster Cooper's trombone, and he starts to play a slow blues that does not have a title. Antwerp, 1976. Photo probably by Otto Flückiger. Wallace Davenport (tp), Buster Cooper (tb), Earl Warren (as), Eddie Chamblee (ts, except-2), Arnett Cobb (ts), Milt Buckner (org-1, vib, voc), André Persiany (p, ), Roland Lobligeois (b), Panama Francis (dr). Note -1 was issued as by Panama Francis. The CD Black & Blue 909.2, Milt Buckner & His Alumni: The Definitive Black & Blue Sessions, is a collection of 13 previously unissued tracks by Milt Buckner and his (Lionel Hampton) Alumni , released 1998. Note -1 was issued as by Panama Francis. 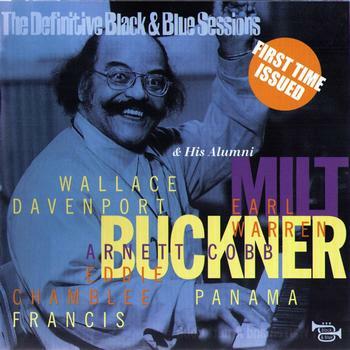 The CD Black & Blue 909.2, Milt Buckner & His Alumni: The Definitive Black & Blue Sessions, is a collection of 13 "previously unissued" tracks by Milt Buckner and his (Lionel Hampton) Alumni , released 1998. Is is most likely though that the versions of Sleep and Bill Bailey from 909.2 are identical to those on 33087 and 950505. Wallace Davenport (tp), Buster Cooper (tb), Earl Warren (as), Eddie Chamblee (ts), Arnett Cobb (ts), Milt Buckner (org, vib), André Persiany (p), Roland Lobligeois (b), Panama Francis (dr). Barclay Studio, Paris, May 30, 1976. 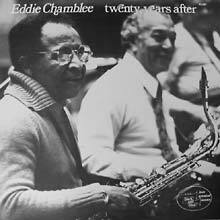 Note: CD Black & Blue 891 is titled "Eddie Chamblee: Blowing In Paris". 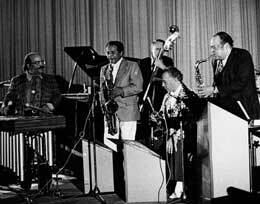 Gene "Mighty Flea" Connors (tb, voc), Arnett Cobb (ts-1), Eddie Chamblee (ts-2), Milt Buckner (org), Panama Francis (dr). Note: Black & Blue 931 is the CD issue of this material. Eddie Chamblee (ts, except-1), Arnett Cobb (ts except-2), Milt Buckner (org), Panama Francis (dr). 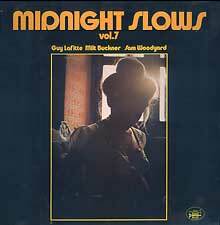 Note: Polydor 2670226 is yet another sampler titled "Midnight Slows". Milt Buckner (p, voc-1), Daniel Mess (b), Michel Denis (dr). André Villeger (ts-1), Milt Buckner (org), Jean-Paul Amouroux (p), Alphonse Masselier (b, except-2), Pierre Michelot (b-2), Pierre Lemarchand (dr). Note: Milan 877878, released 1993, is the CD issue of this material. Milt Buckner (p, org-1, vib-2), André Persiany (p), Roland Lobligeois (b), Sam Woodyard (dr). Marcel Zanini (cl, ts), Milt Buckner (p, org), Jean-Pierre Lindenmayer (vib except-1), Roland Lobligeois (b, except-1), Sam Woodyard (dr). Note: B & B 110 is the CD issue of this material. It is not clear which take of "Deed I Do" it contains. The last two tracks may be from another session. One of these could also be a retitling for the unissued blues. Francis Williams (tp), Al Cobbs (tb), Illinois Jacquet (ts), Milt Buckner (o), George Duvivier (b), Oliver Jackson (dr). Illinois Jacquet (ts-1), Buddy Tate (ts-2), Milt Buckner (org), Koos van der Sluis (b), Sonny Payne (dr). J.P.S. Studios, Leiden (NL), October 22, 1976. Illinois Jacquet (ts-1), Buddy Tate (ts-2), Kai Winding (tb-3), Joop Scholten (g-4), Milt Buckner (org), Chris Smildiger (b), Koos van der Sluis (eb), Sonny Payne (dr). We do not know, which tracks were recorded on which day. The Title of Esoldun FCD 103 is "Play, Milt Play". Illinois Jacquet (ts), Milt Buckner (org), Chris Smildiger (b), Koos van der Sluis (b), Sonny Payne (dr). 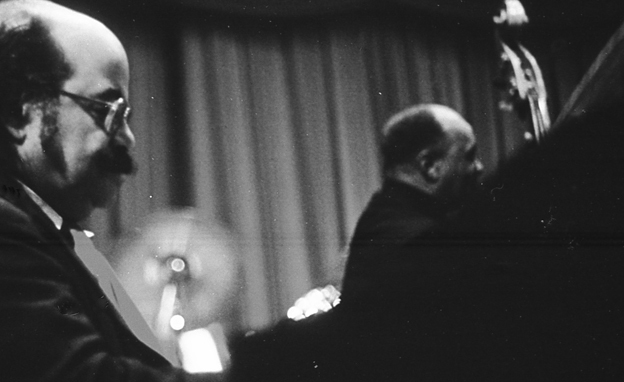 New Orleans Jazzclub, Scheveningen (NL), October 25, 1976. Note: It is not clear from which of the last three sessions the versions of "If I Had You" and "Mean To Me" on Progressive CD 7017 were taken. Personal similar to last three sessions, taken from one of these. Marcel Zanini (cl, ts), Milt Buckner (p, org), Jean-Pierre Lindenmayer (vib), Marc Edouard Nabe (g-1), Michel Gaudry (b), Sam Woodyard (dr). 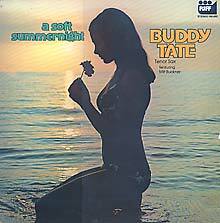 Buddy Tate (ts), Milt Buckner (org), Chris Smildiger (b), Sonny Payne (dr). 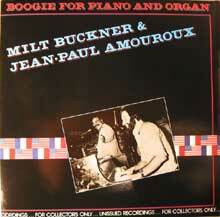 Note: The Rest of this LP is without Milt Buckner. Barclay 900549 is titled "Love And Slows, Vol.1"
Milt Buckner (org), Jean-Paul Amouroux (p), Michel Gaudry (b), Sam Woodyard (dr). Milt Buckner (org, voc), Georges Bernasconi (dr). Milt Buckner (p), Michel Gaudry (b), Sam Woodyard (dr). André Villeger (ts), Milt Buckner (vib), Michel Gaudry (b), T. Martin (dr). Eddie Chamblee (ts-1), Milt Buckner (org), Billy Mackel (g), Michel Gaudry (b), Frankie Dunlop (dr). Note: Tisco Live 77 is a Various Artists LP with the same title. It features artists that played live at the Atlantis Club in Basel, Switzerland in 1977. Guy Lafitte (ts, overdubbed dr on -1), Milt Buckner (org), Sam Woodyard (dr, except-1). Milt Buckner (org), Michael Silva (dr). 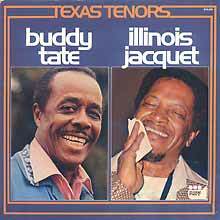 Note: Black & Blue 59190-2 is titled "Guy Lafitte Joue Charles Trenet". 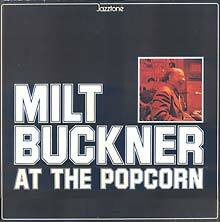 The other titles on this CD are without Milt Buckner. Milt Buckner (vib), André Persiany (p), Roland Lobligeois (b), Michael Silva (dr). Buddy Tate (ts), Milt Buckner (org), Jo Jones (dr). 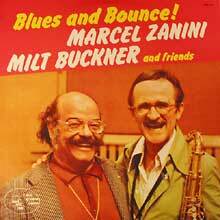 Note: Riverboat 900282, a various artists LP was titled "Jazz A Nantes 1978".